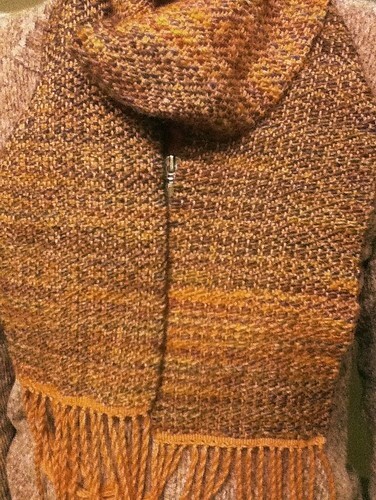 I finally finished the fringes on my second rambler rose scarf/wrap/shawl. It ended up shrinking down to about 9.75″ wide after washing, which means I lost about 1.5″ in width! Quite a bit. I made a true beginner’s mistake by washing it before twisting the fringes. I’ve done this a dozen times without any problems, but this time, the fringes came out of the washing machine in a big knot. They were twisted around each other and nearly each one separated into its own little fringes, meaning I had a huge mess on my hands. Instead of the hour or so I estimated it would take me to twist the fringes, it ran over three. I also had to spritz them to keep them fairly flat, as they had a mind of their own and curved all over the place. Another lesson learned. For anyone who is interested, this is a four shaft pattern. I’m am taking a little breather before jumping into the next multi-shaft project which will use all eight–pinwheels! In the meantime, I’ve been playing around on my other looms, making a cotton belt on the Emilia and practicing some inlay on the Kessenich. Posted on January 23, 2012 December 1, 2014 Categories Tabletop Loom, WeavingTags loom, louet w30, rambler rose, scarf, weaving, wrap1 Comment on It’s a Wrap! Or is it a wrap? It’s 11″ across, so it’s debatable. 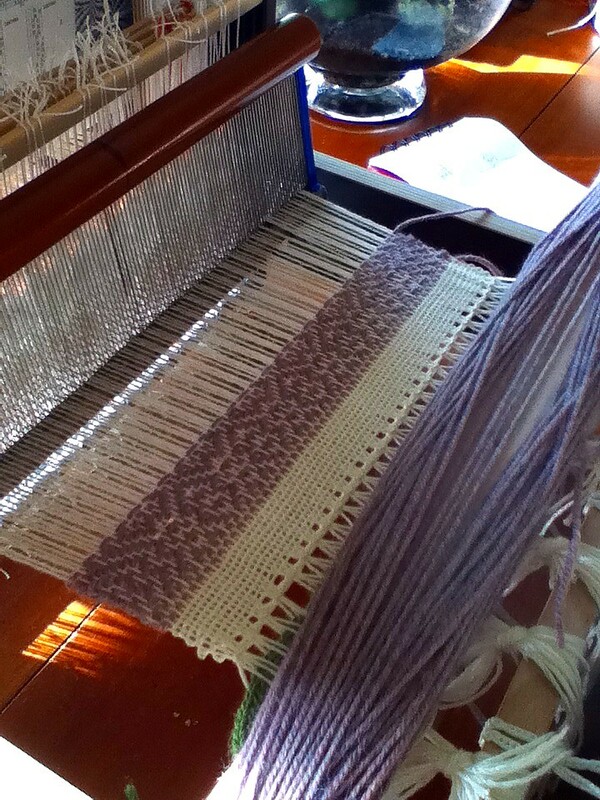 This time I’m using a white cotton/rayon warp (Henry’s Attic) with a lavender/pink alpaca/wool weft (Berroco Ultra). I was worried about the obvious differences between the two, not just with thickness but with softness and color, but so far I really like how it’s turning out. I think the pattern is really pretty and now that I know it by heart, it’s going along quickly. I spent some time studying my loom to figure out how to add the 25 extra heddles to each shaft. It came with just 25 on each, but there was also a package of 200, all connected together with little twist ties and the tops looped from one to the other. I knew there was a trick to getting them on without tangles, and so I watched a Youtube video and twenty minutes later, done! I snipped all the connecting threads and it was kind of fun. No tangles, no tears. 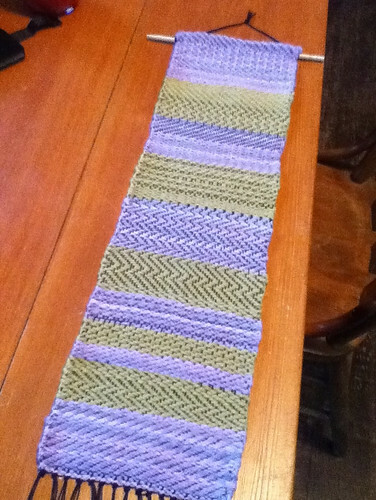 I nearly cried with the warping of this project, however. Strange how I can have very few problems as a beginner, but then as I progress, the problems I read about start happening to me. I was really careful, too! Somehow, while transferring the warp onto the loom, I started getting tangles in the length of it.Some of the threads near the end slipped into the middle. I’m grateful I wasn’t using wool, or it would have ended up felting together and I would have tossed it in the trash. In the end, I got the entire thing on the loom, threaded the heddles and reed and then unwound it all so each thread passed through each heddle. When the warp was unwound all the way to the warping beam, I rewound it. 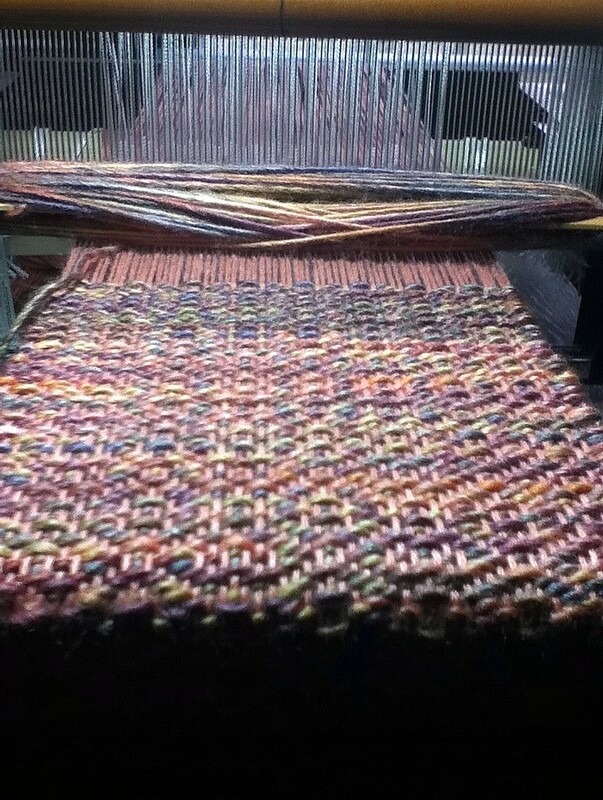 This unwinding/rewinding while the threads passed through the heddles and reed straightened up most of the crossed threads and small tangles. It’s still not perfect, but I’m used to that, so it’s progressing nicely at this point. I also took a cotton ball of rubbing alcohol and managed to take off a little bit of the black Sharpie marks on the reed. It’s still there but much fainter, and the alcohol didn’t harm the plastic cover at all. 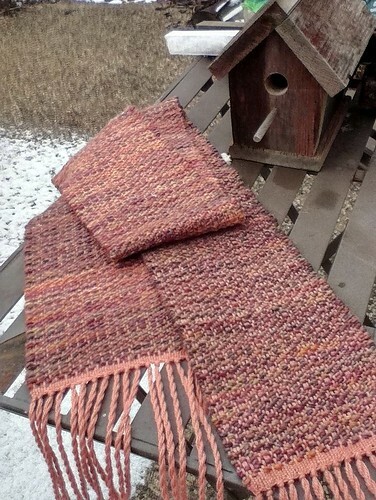 It’s been nearly impossible to capture the color of this scarf, so I gave it another try outside. It still looks muddy, but in reality, it’s a coral warp with a weft that varies from purple to orange. The Rambler Rose pattern is muted but still looks nice. 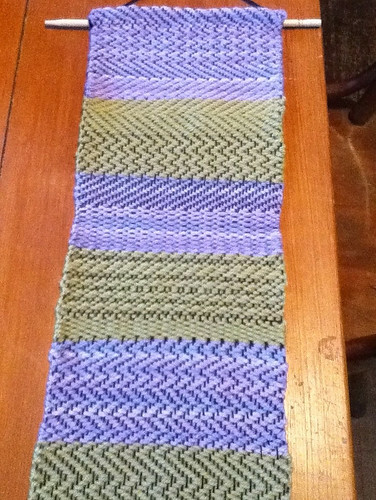 The overall feel of the scarf is not necessarily soft but I’m still game for finishing. I’ve found two errors–oh well! Only two feet done but quite a few more feet left on the loom. Maybe it will be a New Year’s scarf? I have a confession… I'm a a sloppy planner. I do some math to calculate length of warp/number of threads, etc., but then, I kind of guess my way through it. So, I'm a few threads short? No big deal, just modify the pattern and keep going. Too many threads? Tie the excess in a bow and continue on with the project. The warp is too loose on one side? Tuck a pencil under the stands and on you go! So, somewhere along the way, I discovered the drafts or patterns for multi-shaft looms are meant to be balanced weave… meaning in a square inch, the number of wefts = the number of warps. But I kind of specialize in sloppiness, and so I go with the flow. Here, I'm using an alpaca/silk warp (doubled because it's super thin) called Alpaca with a Twist Fino! It's really lovely. 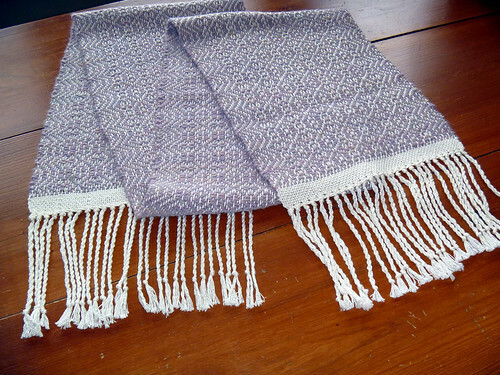 The weft is a far thicker Cascade called Lana Bambu. The pattern is Ramblier Rose from The Handweaver's Pattern Book. So many things to go wrong here… but so far, I do like it. 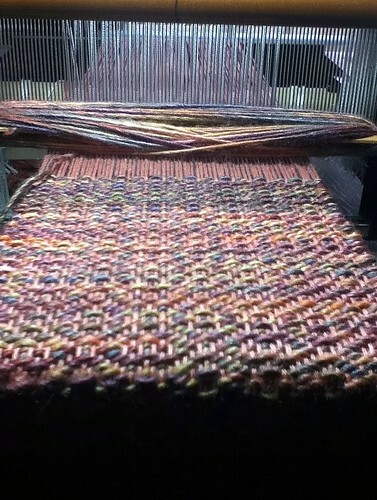 The second weaving on this short, narrow warp… More Birdseye. I’ve got enough warp to try this twice. 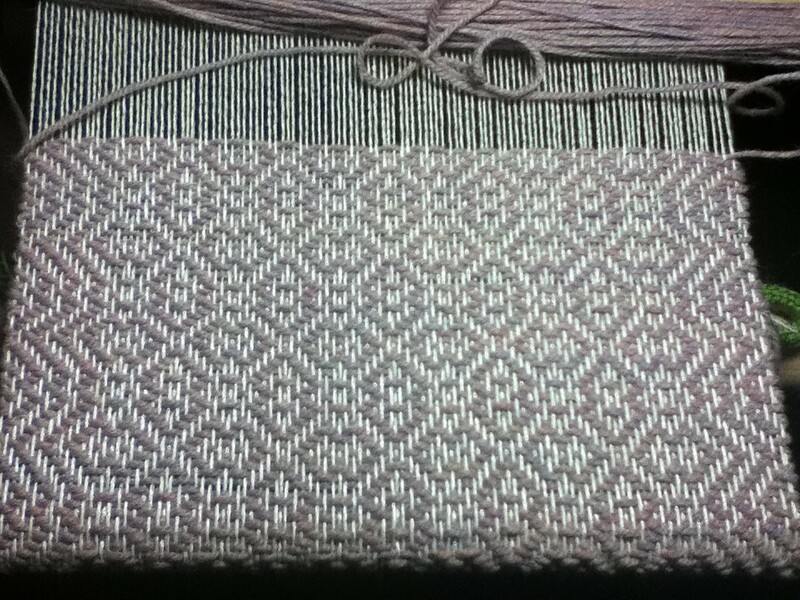 I think I can weave an iPod case/cozy with this 4″ wide fabric. This is a variation of a Birdseye twill–I think. Good thing I write these things down! Posted on December 16, 2011 December 1, 2014 Categories Tabletop Loom, WeavingTags 8 shaft, loom, louet, table, w30, weavingLeave a comment on New Weaving… iPod Case? 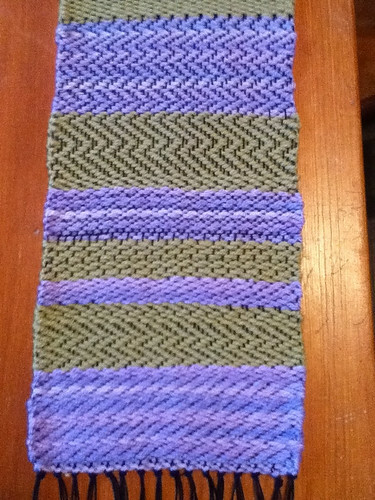 I ended up trying about 14 different twill patterns on this first Louet project, a little sampler. Off the loom it measures 5.5″ x 20″, meaning it “shrunk” about 3/4″ in width. Luckily, I kept track of all the different twills by writing them on a scrap of paper, otherwise, I think I’d have to guess to figure out each section. I do remember that one of my favorites was the vertical herringbone. It’s nice to do a sampler because you can see how different the back of the pattern is compared to the front. Some of them are exactly the same, but if you weave one that is either more warp or more weft-faced, then you’ll have a very different back. I hemmed one end by hand and then used a little dowel to turn it into a wall hanging. Greens and purples… Can’t go wrong with that! My first project: a twill sampler using four shafts on my new Louet. Writing Louet W30 8 Shaft Table Loom each time takes too long, so from here on out, it’s simply the Louet. This is actually a used loom. One of the previous owners had marked the center of the reed with a black magic marker… something I would not do to any loom! I prefer discrete pencil marks. 🙂 But this Louet was 1/2 the price of new, so I’ll take the mark and deal with it. 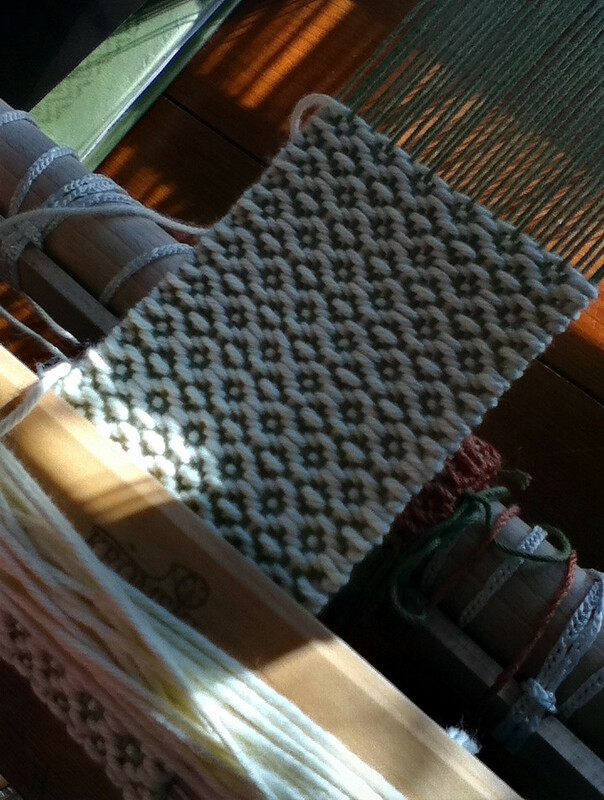 I used a short cotton warp to play around with my new loom and a simple twill pattern. Harness 1 (the one closest to the weaver) is the first strand, harness 2 the second, 3 the third, 4 the fourth, and then repeat. I checked out of the library “A Handweaver’s Pattern Book,” by Marguerite Porter Davison (which I think I should buy if I can find a copy), and discovered several pages of twill patterns I can weave with this exact threading. 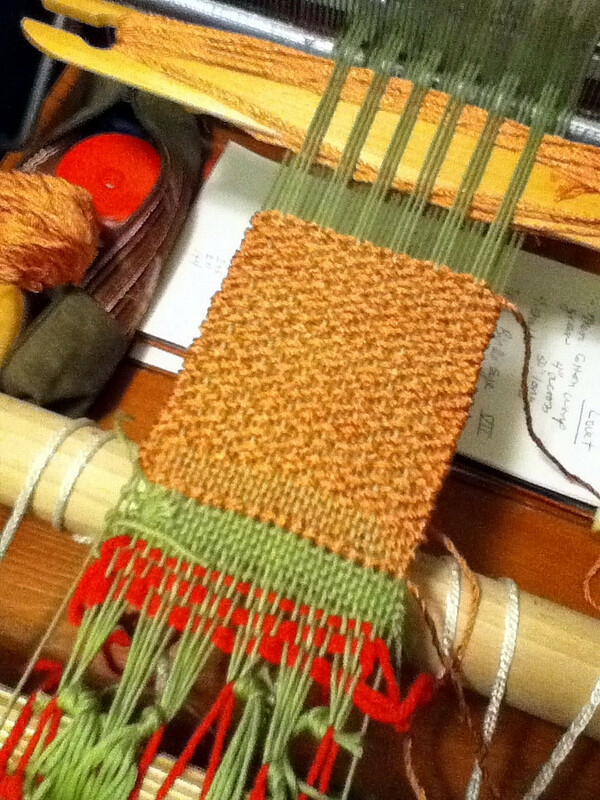 So, I’m getting used to the little loom by weaving twill variations, and so far I love it. My selvages are messy because I have to hook the shuttle over loose strands. In the future, I must investigate floating selvages, which will probably solve this problem. 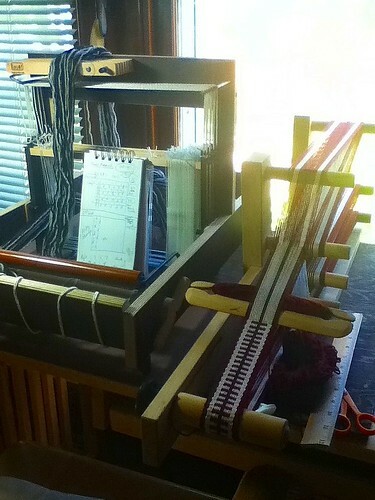 It’s really fun to flip the little levers on the top of the loom to raise and lower the harnesses. I’m only using four of the eight, so my mind is going crazy figuring out what’s next for the Louet. As far as the history of this particular model, from what I understand, the W30 (meaning 30 cm wide of weaving) was once a give-away when an ambitious weaver would purchase one of the huge and expensive Louets. I guess when a weaver would shell out several thousand dollars to get a room-sized Louet, the W30 was just a perk. The small loom was probably used as a sample loom to practice a pattern before going to the trouble of warping the big loom. 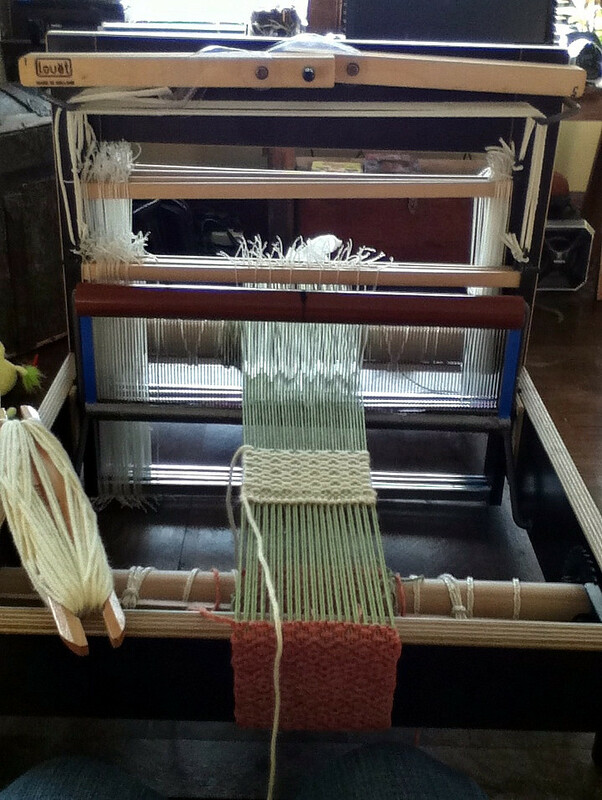 Because the tower can be taken off and the loom is easily transported, it is also used as a workshop or demo loom. Since then, it’s been sold as a stand-alone loom, and it can still be purchased from a few vendors, but it’s no longer in production and Louet doesn’t sell it any longer, having put their energy into the sturdier Jane table loom. Although this loom is just what I wanted, it does have a light feel and if you’re the type of weaver who has a heavy touch, you may not want to choose this one. However, it’s compact, versatile and perfect for me. 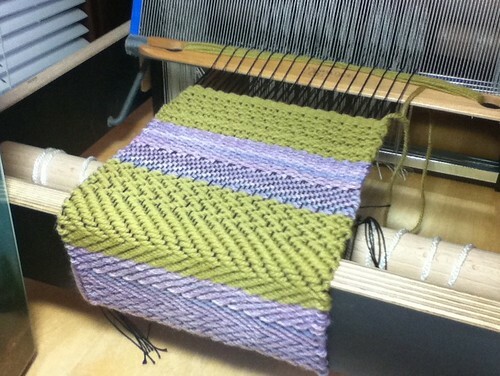 The Ashford loom company has some wonderful how-to videos on warping a multi-harness table loom. There are three sections: one on winding the warp, the second on transfering it to the loom and using a raddle, and the third on sleying and tying on. I picked up a ton of great tips by watching them. After my last post, I wasn’t certain I’d actually see a four o’clock pattern emerge from this crazy project, but I started over with thinner thread, and lo and behold! Posted on April 22, 2011 March 25, 2014 Categories Tabletop Loom, WeavingTags kessenich, tabletop loom, two harness, weaving2 Comments on Is It Four O’Clock? Plarn = plastic bags cut into strips and used as yarn. Plarn is fun, and it's green! 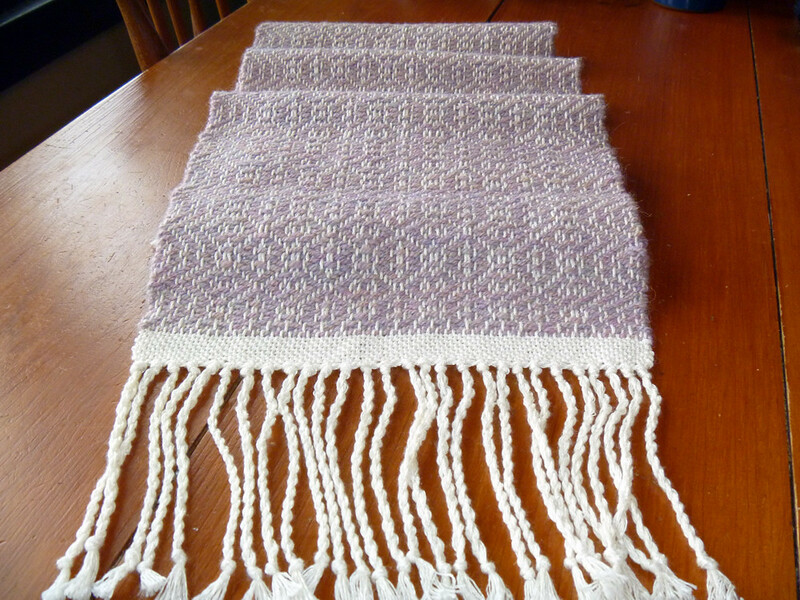 I used the 10 dent heddle on the Kessenich two-harness loom, warping every other slot–70 ends total –with white crochet cotton for the warp, bought for a quarter at a thrift store. I probably used about ten cents worth. Then, I cut ten plastic sacks into strips, using a tutorial I viewed on Youtube. The red handle is some acrylic I spool knitted on a little crank knitter. So, all in all, my weaving cost me about fifty cents. Ritzy! I wove 20 inches but now wish I would have taken the time for another five to ten, because although this little tote is cute, it's not really useful. It's probably just big enough for a few DVDs or one or two books. I don't plan on lining it, but I am planning on another plarn tote, this time bigger.